AMEC/Black & McDonald ran into some challenging site conditions—everything from swampy terrain to regular bear visits—in building the 99-MW Cape Scott wind power project on northern Vancouver Island, off Canada's west coast, for GDF Suez Energy North America. You know your wind farm project is off the beaten path when you run into bears—and they are regular visitors to the work site. That was what AMEC/Black & McDonald found when it was working on the 99-MW Cape Scott wind power project on northern Vancouver Island, off Canada's west coast. AMEC/Black & McDonald provided engineering, procurement, and construction for Cape Scott, the first large scale wind project on Vancouver Island and only the fourth large scale wind project in the Canadian province of British Columbia. The two companies, AMEC and Black & McDonald, have worked as a joint venture on many projects, including a large number of wind projects for Cape Scott owner, GDF Suez Energy North America. This project marks GDF Suez's first wind project in B.C. The company already had wind power projects in the Canadian province of Ontario and on the east coast of Canada. GDF SUEZ Energy North America manages 30 renewable facilities in North America powered by wind, solar, biomass, and traditional hydro technology, totaling a capacity of 863 MW. Wind energy is still in its relative infancy in B.C. Like its neighbor to the south, the State of Washington, B.C. gets most of its power from hydro—more than 90 percent of the power generated in the province comes from hydro power, mostly from large dams. But B.C. is starting to diversify its power sources—Cape Scott being the most recent example. With a cost of more than $300 million, the Cape Scott project is powered by 55 Vestas V100 1.8 MW turbines and occupies a total footprint of 864 acres outside of Cape Scott National Park. AMEC/Black & McDonald's scope of work included upgrading 11 miles of existing forestry road to accommodate heavy shipments, construction of 21 miles of site access roads, and 25 miles of 138 kV transmission line. The line connects the generating facility to the grid and supplies power to customer BC Hydro, under a 20-year power purchase agreement. Also included were the design and construction of wind turbine foundations, the electrical collector system and switchyard, and turbine erection and commissioning. Building in the swampy terrain of Vancouver Island's northeast coast proved to be a civil engineering feat for GDF Suez North America and AMEC/Black & McDonald. Situated 25 miles west of the town of Port Hardy, the Cape Scott wind project site soaks in up to 13 feet of rain annually, and accessing the site on a plateau, over steep hills and twisting dirt and gravel roads, was a daily feat. Illustrating the remote location of the site, AMEC/Black & McDonald project manager Bryan Burt noted that bears were regular visitors, and there were cougar sightings, as well. A pack of 12 wolves came through the site twice a year. The wildlife visitors proved to be no problem; construction crews just gave them a wide berth, says Burt. Much of the early construction focused on clearing segments of the 15 square miles of land for roads and the turbines, transmission lines, and the substation. Before the 55 turbine and substation foundations could be poured, crews had to assemble a small concrete batch plant on site. Ground conditions posed the greatest challenge, he says. "I have put in more than 4,000 MW of electricity generation over the years, and this is the most complex 100 MWs I have ever done." On northern Vancouver Island, the paved road ends at the town of Port Hardy. From there, the dirt/gravel road began, with some secondary forest service road, logging road, and then the new road that had to be built. "The existing logging road required quite a bit of improvements for transporting equipment," says Burt. "The forest service road, though, was semi-improved—we just had to widen that a bit. We had to change out one bridge, and we had to do a bit of work on the corners so that when the tail end of a turbine blade came around, it would not hit trees or dirt." When it came to cutting new road, there was a great deal of rock and swampy conditions, which dictated how quickly construction could be carried out. "Our progress on road construction was consistent, but it was just slower than we anticipated," said Burt. With the roadbuilding, and on the wind project itself, there were environmental considerations. "There were a lot of things that we had to be aware of and watch out for, most of it having to do with the water runoff. We needed to keep the streams clean because even though we were up pretty high, there were fish-bearing streams. "We had to be very careful about oversilting stream beds," explained Burt. "With our bridges, we had to put abutments in from both sides, so we did not have a lot of traffic going into the water of the stream, minimizing the impact. We didn't have any environmental damage as a result of construction." Burt emphasized the numbers the project involved: when the roadwork was complete, crews had installed a total of 23 bridges, 67 imbedded culverts, and 500 cross-drain culverts. "That was new to us. We've never had a project where we had to put in such a high number of bridges and culverts." And the environmental bar was set high; for example, a culvert could not be substituted for a bridge. Ontario-based Surespan Wind Energy Services was the subcontractor for some of the roadwork, as well as the bridge and culvert work. They used local environmental consultants Pacificus Biological Services Ltd. of Port Hardy any time civil work was being done. Further underlining the challenge they faced with the ground conditions, and the amount of rock they had to deal with, was the quantity of explosives required for blasting and clearing. "On the wind project site itself, we had to blast almost everywhere we had to dig: many of the foundations for the turbines and the foundation for the substation. More than half of the wind turbine foundations had to be blasted to get them to the right elevations." There were also some turbine sites that had swampy land near the edge of the foundations, and this had to be removed. There were two quarries on site to feed the on-site batch plant. Aggregate and cement were transported to the site from Port McNeill, south of Port Hardy. "There was also a lot of blasting for the road construction," says Burt. "There was no real good soil for road construction—you were either in rock or in swamp. We had to design road, so sometimes we would be bridging across a swampy area. We'd put a layer of fabric down and then build a layer of rock on top of that, so the road was actually floating." They used blasted rock for ballast. Being the west coast, home to some of the largest forestlands in Canada, there were some trees that had to be removed, with some larger trees at lower elevations. "But after we got up to the top of the plateau and the project site, it kind of leveled off there, and there were not a lot of trees. Whatever trees there were, were small, maybe 12 feet high." The project site's elevation varies, but it is generally at about 400 meters above sea level. More clearing was done for the 25-mile long transmission line. "The transmission line was a good challenge in terms of access, planning, clearing, and a construction perspective," says Burt. "It went up and down through the Coastal Mountain range." They worked with two firms that had logging rights in the area to do the clearing. Burt praised the local contractor community and their experience working in these adverse conditions with that extent of rock and swamp. "There were a lot of smaller contractors there that knew their way around and were just perfect for the job." 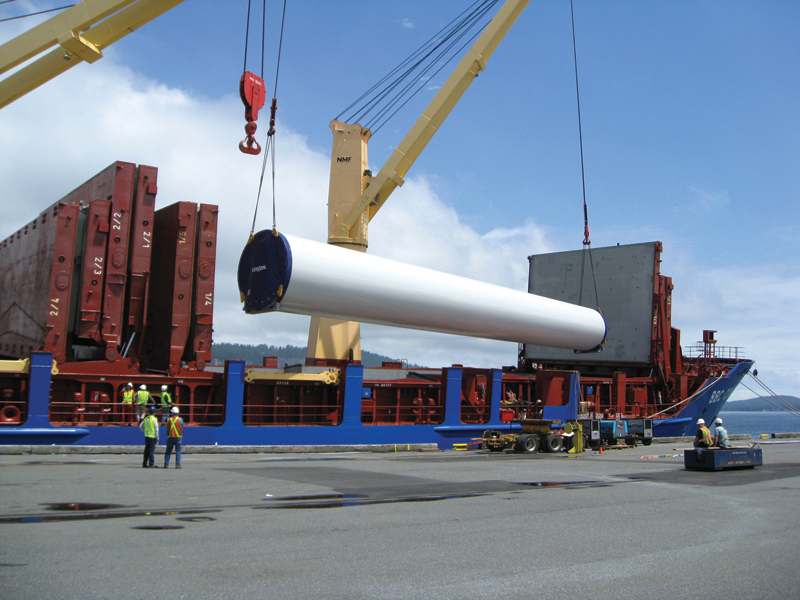 As with most wind projects, some of the biggest challenges involved logistics. In the case of Cape Scott, no real surprise, the logistics involved the road. "We had to get the construction equipment off the road before we could start turbine deliveries because there was just not enough room for all of that truck traffic," explained Burt. "With other wind projects, you might have other ways of accessing the site. With Cape Scott, there was one way—you went up the mountain up that road, and it was 25 miles long." There were two access points, though just for road construction: a main access and back access. "That gave us two fronts to work from, rather than just one. If we had not done that, it would have taken us an extra month or two to build the roads. But that back access road was not good enough for turbine deliveries." The trucks bringing the turbine components in to the site came from Port Hardy. The components were first off-loaded at the Port of Nanaimo, about 250 miles south. A staging site was set up in Nanaimo, and from there, the components were transported on highway trucks. 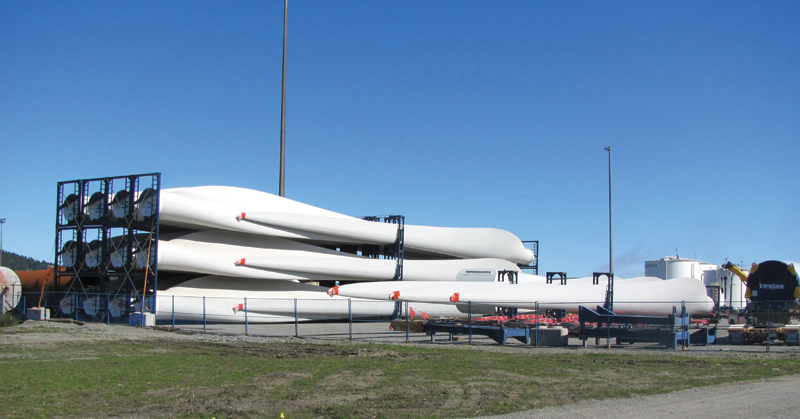 Turbine supplier Vestas also set up a staging site in Port Hardy, where the components were transferred to off-road trucks, for the trip in to the project site. They had excellent highway to get the components to Port Hardy. But this being the first wind power project on Vancouver Island, transportation authorities were very careful about permit scheduling. "The province was a bit concerned about this part of it, and the permits reflected that," says Burt. "Once we got started though, they realized that traffic could get around the trucks, and they allowed us to increase our delivery rate." The turbines were all ready to go for AMEC/Black & McDonald, because they had taken over the EPC contract from another company, and there had been a bit of a time lag as a result. "Port Hardy was really the important staging area for us," Burt says. "As soon as we were ready, Vestas was moving the turbines to us. We wanted to receive all the components of one turbine at a time from there, rather than have components in different locations." The objective was to deliver one complete turbine per day—the three blade sections, the nacelle, and other associated components. "It was all staged so it would all go to one site for one turbine." AMEC/Black & McDonald told Vestas when they wanted to take delivery of the first turbine, and Vestas figured out the full schedule of deliveries from Port Hardy from there. "It was their job to provide enough components to stay ahead of us from there on in—and they did exactly that." 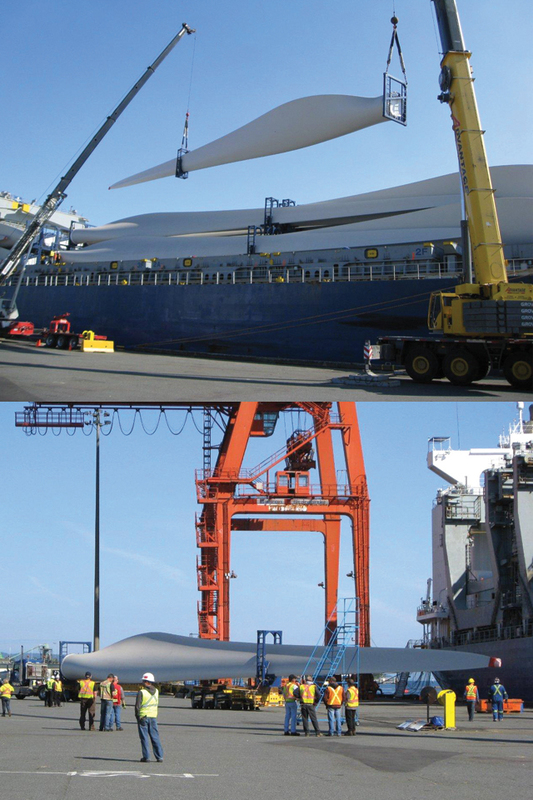 The Vestas wind turbine components were offloaded at the Port of Nanaimo on the east coast of Vancouver Island, about 250 miles south of the Cape Scott project site. A staging site was set up in Nanaimo, and from there, the components were transported on highway trucks. B.C.-based Eagle West Cranes did the turbine erections. Ohio-based Project CPM served as construction scheduling consultants on the project. AMEC/Black & McDonald worked closely with Vestas, and of course, with project owner GDF Suez. Plan of the Day meetings were scheduled, and they also did monthly meetings, where big picture progress was reviewed with GDF Suez. As the project came closer to completion in mid-2013, there were more GDF Suez people working on site and involved with the commissioning. The fact that AMEC/Black & McDonald had done many projects for the company meant that they knew what the expectations were with GDF Suez. "We worked well together—there was a lot of good communication," says Burt. One of the items often on the meeting agenda was the weather—which is understandable when you are working in an area that gets 13 feet of rain a year. They had some snow storms, but those were just on the colder, west side of the wind project site. The east side of the site would get more rain, rather than snow. "The snow really never shut us down completely, but it delayed us a week or two here and there," says Burt. "It was more an issue of getting snow off the roads so people could travel safely to the work site. As for the rain, well, you just get used to working in it." Burt added that in 2013, they had a three-month period with little rain, which dovetailed very nicely with the time the project was being commissioned. The Cape Scott project is located on the traditional territories of First Nations, and GDF SUEZ worked closely with the Quatsino, Tlatlasikwala, and Kwakiutl communities during the project. "We and GDF Suez met with the First Nations groups every month—their cooperation was critical," says Burt. There was an agreement to hire First Nations band members first, wherever possible on the project and with any subcontractors. "There was quite a bit of interaction to make sure the involvement of First Nations was maximized," explained Burt. "We had a First Nations road contractor, Three Nations Contracting, that was very experienced at building forest service-type roads, and that served us very well. In general, we had a good relationship with the First Nations—we did not have any issues, and there weren't any protests." Burt said that they worked on the basis of "best efforts" to hire First Nations members, rather than on mandatory percentages or numbers. The company often required some very specialized skillsets, especially in specific areas, such as the blasting. "You want to make sure you have exactly the right people, especially when you are working with heavy equipment and explosives." location. Cape Scott sits at the western-most end of B.C. and Canada—and it's a remote end, at that. Looking west from the site, all you see is ocean—the next landfall is …Japan, some 4,500 miles away. "There really was no "next day" delivery of anything," he said. "Getting something in to the site from a major center might take two or three days, so you had to anticipate your needs and plan ahead." But then there was the bonus of working in such a spectacular setting. "It really is beautiful country up there," Burt says.